The 25th Conference of the International Purchasing and Supply Education and Research Association (IPSERA) in Dortmund attracted more than 200 academics from all over the world, including 4 from Hungary. Out of the 127 papers presented, two of them came from Pannon University. 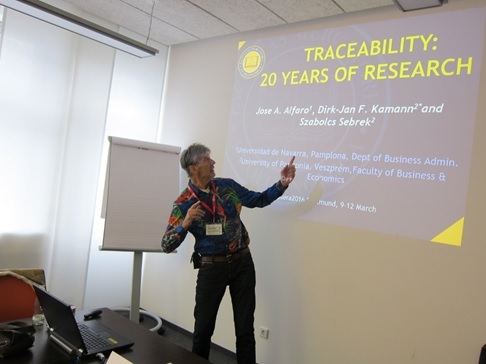 The first paper, about the topic of Traceability was authored by Spanish colleague José Alfaro from and Pannon researchers Dirk-Jan Kamann and Szabolcs Sebrek. The second paper was on the use of Experiments and dealt with the impact of professional norms on behaviour. This paper was authored by Max Boodie (NL), Dirk-Jan Kamann (Pannon) and Jana Vyrastekova (NL). Both papers were received well and led to new cooperation with researchers from several German universities, Dublin, Michigan and Milano. At the end of the 4 day Conference, the next year’s Conference to be organised by Pannon – together with Corvinus – in Budapest and Balatonfüred was presented by the Chairman of the organising committee, Dirk-Jan Kamann. It received a warm welcome from the participants. “See you next year in Budapest-Balatonfüred” was the slogan used by everyone.